Chelsea defender the subject of late interest in the transfer window? 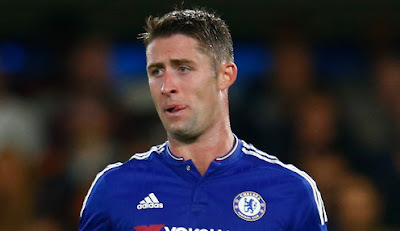 Gary Cahill has become the subject of intense speculation over his Chelsea future recently after it had been reported that Cahill has become increasingly frustrated at the lack of first team football. With the transfer deadline approaching on Monday, I just wonder if someone will come in for him at the last minute? Cahill's form this season hasn't been anywhere near good enough and he has found himself out of the side playing back up to John Terry and Kurt Zouma. At this moment in time you would be hard pushed to find anyone that believes that partnership should be broken. Cahill now faces a struggle to force his way back into the managers plans ahead of this summers Euro 2016 tournament. It's likely however, that he will start against the MK Dons this afternoon. "He is of big value and will prove that in the upcoming weeks. If players are not playing frequently they must get a bit frustrated. I talked to him a few days ago about the situation. He is not to be considered as second team. He is of big importance and will be in the upcoming multitude of games. He was very open and very clear that he wants to stay in this club. He is very happy here, but not playing gives a little bit of frustration, which is normal. There was no hint from his side "can I leave the club". Nothing. He is very happy, and as far as I'm concerned, I will have him in the upcoming month and the club will have him for the upcoming years." Pretty emphatic from Hiddink stating that Cahill is happy here but with the new signing of Matt Miazga confirmed by Chelsea, I wonder if he will force a move before the window closes on Monday to get back playing regular first team football to ensure he is selected by England boss Roy Hodgson this summer? Cahill is normally a good, solid defender. He is underrated in my opinion because he awareness in his own box to make important tackles and blocks is second to none. The only concern I have is that when he is outside the box his awareness is an issue and his use of the ball. He has found himself wanting, has been caught out and has lost the ball in key areas that has cost Chelsea earlier in the season. I guess it all comes down to confidence and you only get that by playing on a regular basis. Will he stay at Chelsea and force his way back into he side between now and the end of the season? Only time will tell!